Never settle for second best and always keep an open mind, says Drew McDonald, winner of the child health award at the 2017 RCNi Awards. Drew McDonald qualified as a children’s nurse in 2005 from Robert Gordon University in Aberdeen. 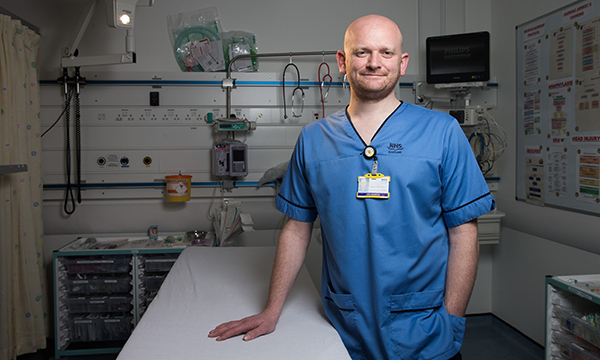 After working in neonatal care and on a medical ward at Royal Aberdeen Children’s Hospital he moved to the emergency department, where he has worked for the past ten years. Promoted to band 6 in 2013, he is now sepsis lead nurse for the hospital. In May, he won the child health award at the 2017 RCNi Awards for developing a tool for identifying sepsis in children. To ensure all our staff have the necessary training, equipment and skills to deliver the best possible patient care. Children and young people, from birth to age 16, who attend our department with anything from minor illness to major trauma. The fast, unpredictable nature of working in the emergency department (ED). No two days are ever the same. There can be sad moments in the paediatric ED, but we deal with them professionally and try to keep our emotions in check. Providing safe and excellent care to all our patients, regardless of the difficulties we may encounter. We don’t settle for ‘that will do’. By learning from every opportunity, including mistakes. I will wait and see what comes up. Who knows what the future will bring. Never settle for second best, keep an open mind, and remember that change is Okay.